The Golden Retriever is gentle, intelligent, kind and loyal. Golden Retrievers are popular family dogs with their affectionate and caring nature. Unlike many other breeds they do not demand continuous attention from their family or handler. They are friendly with children, strangers and other dogs. Golden Retrievers are easily trained and obedient. Some of these dogs make good watchdogs, others do not. Golden Retrievers can be trimmed occasionally for a well-groomed appearance and they need regular brushing and combing. The excess hair between the pads of the feet also needs to be trimmed and the ears checked for dirt or wax build-up. The Golden Retriever adapts itself to the family activities, but it does need more exercise than the average dog. They enjoy retrieving, swimming, obedience training and agility sports. These dogs not only need to be kept physically healthy but also mentally healthy, so it is important to keep them occupied. In the 1860s, Lord Tweedmouth in Scotland purchased an only yellow puppy from a litter of black Flat Coated Retrievers. His aim was to breed retrievers of this lighter color. He crossed this yellow dog with a liver Tweed Water spaniel (a breed that was hardy, intelligent and able to retrieve game in all sorts of weather). From 1867 onwards, Tweedmouth's gamekeepers recorded all matings and conscientiously evaluated the results. 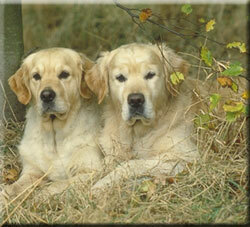 As the conformity of this dog became established, these yellow retrievers became a breed in their own right. They were first shown in 1908 and were recognized by the English Kennel Club in 1913. General Appearance: Solid, laid-back and gentle. Color: Any shade of gold or cream. Coat: The outercoat is flat or wavy, waterproof with feathering. The undercoat is dense. Tail: Thick, well-feathered and never carried over the back. Ears: Medium size, set high and hanging close to the cheek. Body: The ribs are deep and well-sprung. The topline is level with a strong, muscular loin. The shoulders are long, wide and well laid back. Golden Retrievers are used as guide dogs for the blind and as drug/explosives detectors.